Have you ever hugged a tree and seen it grow bright? How about see a tree react to the swipe of your hand or respond to your singing? No? 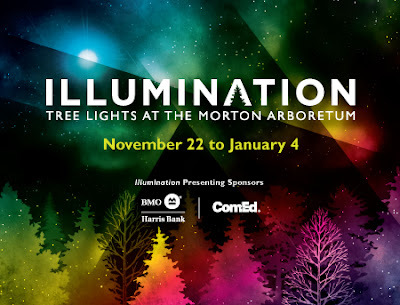 Well, you will be able to at Morton Arboretum's new Illumination event! During the event your family will walk along a paved trail and see the trees come alive via LED lighting technology. See dazzling projections, beautifully bright and bold colors and trees come alive as you interact with them. We love the Morton Arboretum and cannot wait for this innovative event! The event happens along Meadow Lake and through Confir Walk--two very lovely portions of the Arboretum! With crystal chandeliers in the trees, delightful snowflakes and even your own image projected in the trees, this event promises to be like no other! Walk along a gentle 1-mile paved trail that will take you about 1 and half hours to walk along. Along the trail, you will find concessions stands that include fire pits for making s'mores! Warm up or even purchase a small treat! Guests can also view the magical Enchanted Railroad during their visit. Both tree and train fans will be in heaven! Be sure to stop by the museum store to browse special holiday gifts! The event begins Friday, November 22nd and runs through January 4th. The event begins daily at 4:30PM with last entry at 8:30PM. Please note that the event is closed November 28, December 2, 9, 16, 24, 25. A $5 transaction fee will apply to all phone orders. General Admission: Daytime Arboretum admission for the same day as your Illumination ticket is included with your ticket price. You can purchase tickets via the Morton Arboretum website. Guess what???? The Morton Arboretum has so generously provided us with a family pack of four tickets so one lucky family can attend this vibrant event for free! The tickets will be sent to the winner by the Morton Arboretum. How do you enter? Check below! The giveaway will end November 24. **Disclosure: The Morton Arboretum provided us with complimentary tickets to the event for sharing with you. All opinions are 100% my own. Willow tree is my favorite tree but I Love the flowers from cherry trees!